Ditch your grill to make your ribs in the oven! 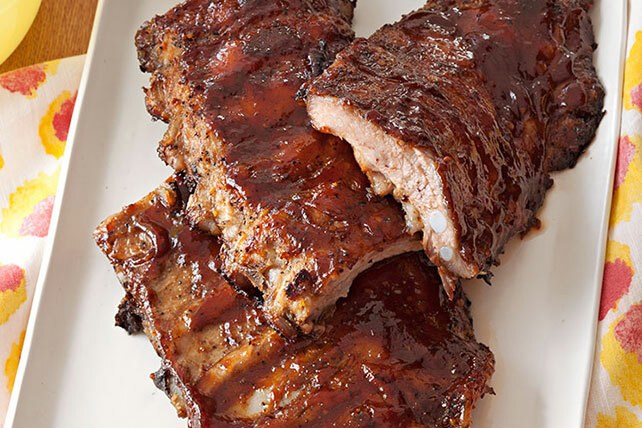 You can even make our delicious BBQ Ribs in the Oven during a blizzard or rainstorm! Place ribs, meat sides up, in single layer on 2 foil-covered rimmed baking sheets sprayed with cooking spray. Sprinkle with Dry Rub; rub into meat. Cover. Bake 1 hour. Brush with about 1/4 of the barbecue sauce. Bake, uncovered, 1 hour or until ribs are tender, turning and brushing with remaining barbecue sauce every 15 min. Serve these ribs with smart sides, such as grilled vegetables and whole wheat rolls. Prepare using A.1. Dry Rub Sweet Mesquite BBQ.